Web accessibility seems to be gaining ‘buzzword’ status. We delve a bit deeper to find out what exactly it is, what it means, not just for UI/UX designers, but also for web developers and end users. Realm Digital Designer, Mikki Lourens explored the topic a bit more, and here is what she unpacked. Web accessibility is about making your website accessible to all internet users, abled and differently-abled. There are a number of impediments that could prevent someone from enjoying the fully intended purpose of a website. For example, if your website makes use a lot of red and green, a colour-blind user may have a lesser experience. It is the job of the designer, developer or website owner to accommodate them as far as possible. In addition to the four principles, there are six inclusive design principles to keep in mind when designing your website or app. Providing a comparable experience ensures your interface is accessible for all of your users, in whatever way they want to view your website. It comes down to ensuring there is an alternative view for your site, this could be using alt text for images, a transcript or audio descriptions. Ensuring that a visually-impaired user doesn’t get trapped by a notification that won’t go away before pressing a button that isn’t accessible, or making provision for hearing impaired users by ensuring that all videos have clear subtitles are ways to provide a comparable experience. Consider all of the different user types that may visit your website. People who are first time users, established users, users at work, users at home, users on the move, and users under pressure. All of these situations can have an impact. Make provision for all possible user scenarios. When you design and develop a website, always keep in mind that you don’t have to reinvent the wheel when it comes to setting up your interface. Keeping things simple and easy within a layout that a user is already familiar with, will help make your website easier to understand by everyone. Be consistent, be clear, keep things simple, and don’t use 20 different layouts, just stick to one and flow with it. Designers are generally quite set on having a website display exactly the way we think it should be. This may at times include elaborate images that slide and move, flashy bits of design that we want to strobe or even an infinity scroll function on our gallery. Even though all of that may be aesthetically pleasing, it could be a barrier to entry for certain users. A user suffering from epilepsy will not respond well to a flashing, strobe-like effect on your site. In the same breath, a user who is only able to navigate by means of a keyboard will not see the benefit of a lazy load. Rather opt for a ‘Load More’ button making it easier and more inclusive for everyone. Although it is difficult to guess how your user may navigate through your website, it is possible to guide them and focus their attention on certain tasks, features, and information. Websites and other interfaces can be difficult to understand when core features are not clearly highlighted and prioritised. It is essential for a UI/UX designer to think about the user and walk in their shoes. It might be easy for a designer or developer to navigate through a complex site, but for a user who doesn’t have experience with it, it may be a great cause of frustration. All features should add value to the user experience, providing diverse ways to find and interact with content on a website. Things like voice command compatibility, geolocation, camera and vibration API’s are great elements to add to your website where necessary. Ensuring your website is as accessible as possible is essential to the journey of all users. While we aim to have an aesthetically pleasing product, the intent behind designing and developing it should be to make it accessible for all. No user should ever feel hindered, frustrated or excluded. 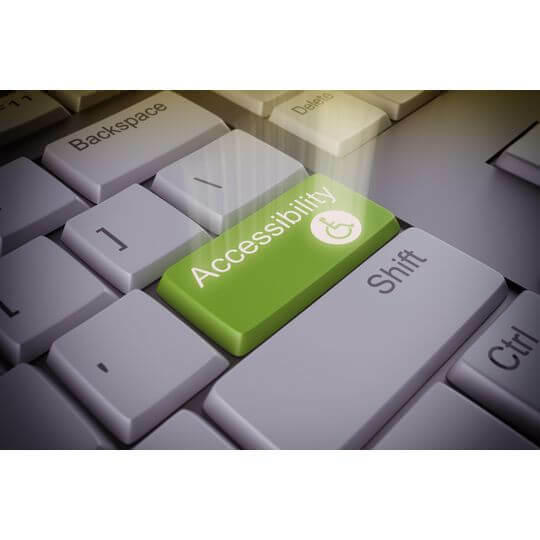 Is your website accessible to all? What improvements could you make to ensure you’re reaching a wider audience? We would love to have a chat, get in touch with us!